***DISCLAIMER*** Since the lighting was so dim, I had a difficult time getting good shots of the food. Sooooo please bear with me! You will see all of my attempts in changing my camera settings with not much luck. I didn't post all of the food pictures because some were so dark. 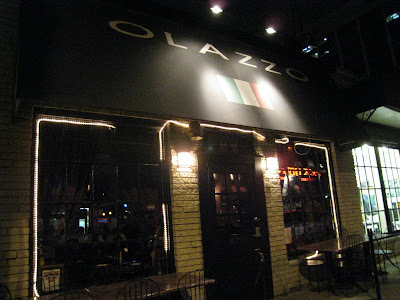 Last night an old friend of mine and I went to Olazzo Restaurant for dinner. It's an Italian restaurant in downtown Bethesda. The closest metro stop is Bethesda on the Red line. The area surrounding the restaurant has street parking, and a garage one block away on Cordell Ave. It is one of the many small restaurants in that part of town. Olazzo offers a few tables for outdoor seating when the weather is pleasant. It has a sort of rustic look with the brick, wood door, and divided windows. The interior is small. This pictures shows 1/2 of the place already. It is very dim in there as you can see. 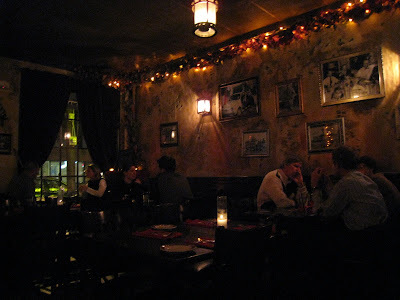 There are some sparse Christmas lights on the ceiling and only some tables had candles. The lighting gave the room a very romantic vibe, and makes the space much more intimate. There was no wait for a table, and when we first walked in about 1/2 the tables available, but filled up shortly after. There is even a fake-flickering fireplace on the wall, which is pretty neat. Every entree comes with bread and salad. 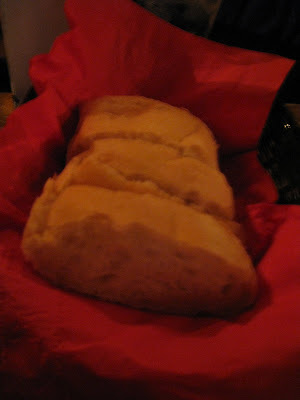 The bread was warm, soft, and almost tasted like sourdough. 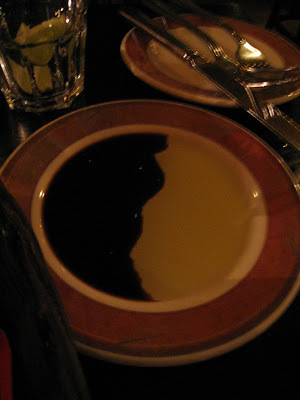 The bread was served with an olive oil and balsamic vineger 'yin yang'. Each entree order comes with their 'house salad of romaine lettuce and mixed greens tossed in light vinaigrette with cucumbers and red onions'. It was just the right portion before my entree. 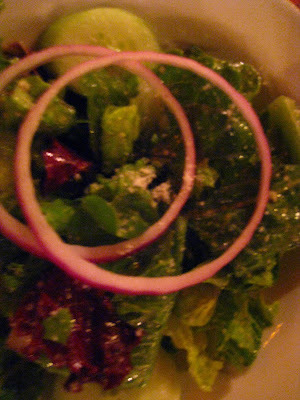 It was light and a great starter. Had I purchased the salad separately, it would've cost $7. My friend ordered a cheese ravioli dish. I couldn't find it on the menu. Perhaps it was an evening special, but she recalled it being around $12. 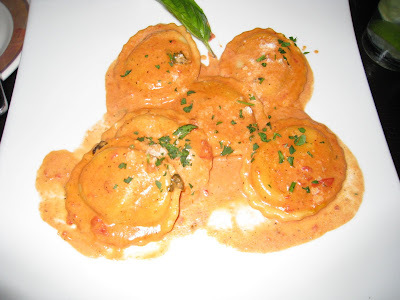 There were 6 large raviolis on a plate with a creamy tomato sauce. She described them as being flavorful, seasoned well with black pepper, and a good dish for a light dinner. 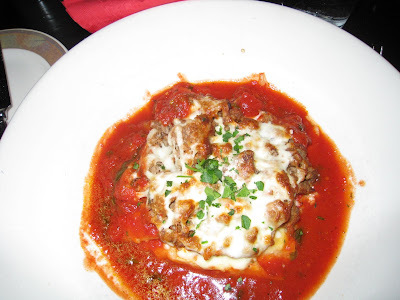 I ordered the 'Lasagna Alla Bologenese - pasta sheets with ricotta, mozzarella, seasoned ground beef and red sauce' for $13. It was so delicious! It looked huge, but it did not sit heavy in my stomach at all. I ate the entire thing. 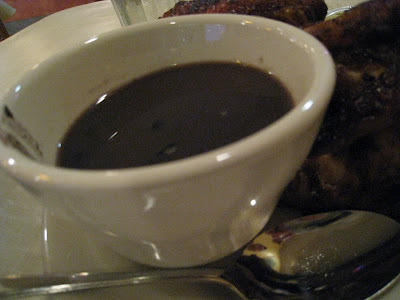 The sauce had a slight kick to it, and the seasoned beef reminded me of sausage. Very tender pasta sheets, and all of the flavors worked well together. We ended the meal with a cannoli. It was very good with just the right amount of chocolate chips in it. On Monday nights they offer 1/2 price bottles of wine. The most expensive full bottle is $32. Then on Tuesday nights they offer $5 martinis. I would recommend this place if you like having a drink with your meal since the drink menu is larger than the food menu. If you are looking for a tasty meal, and a cozy/dim atmosphere, then this place would be great for you. It is reasonably priced with the most expensive entree being $17. Extra meats cost between $4-5. 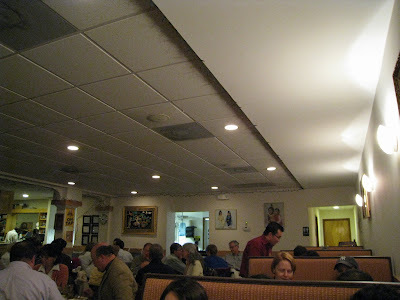 A week or 2 ago I got to try Mandalay Restaurant & Cafe in Downtown Silver Spring. It is about a block away from the new town center part, and the closest metro stop is Silver Spring on the Red line. 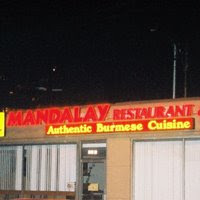 This is a Burmese restaurant which serves food from Myanmar, formerly known as Burma. For those of you that have never heard for this country it is located in in Asia in between China, Laos, Thailand, Bangladesh, India, and the sea. Due to it's geographical location its cuisine shares similar characteristics with its bordering neighbors. 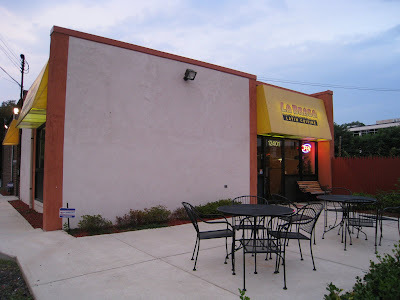 The restaurant is located on a small side street that has limited meter parking. There are metered city parking lots close by and a garage on Wayne Ave one block away that is free at night. Walking into the foyer of the place you will notice around 30 dining awards on the wall from newspapers, Washingtonian Magazine, etc. Sorry I don't have a pic! 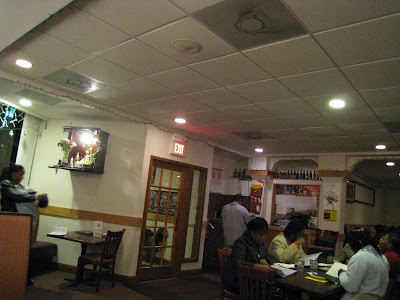 The interior of the place reminded me of a chinese restaurant. Large enough space, large round tables in the center, and framed pictures on the walls. There wasn't anything too glamourous about the decor. They did have hanging christmas lights around, however they weren't turned on. As you can see the place was PACKEDDDDDDD. It was a saturday night around 7:30pm, but only waited about 15 minutes. What is nice is you can wait in their lounge room off to the left. Sorry no pics! But there is a bar, bar tables, a very large plasma screen tv, and random decor. There are 4-person booths along one wall, and that is where we were sitting. Throughout the night I think we had like 4 different servers help us, so it was a bit slow sometimes. Let's talk about the menu. 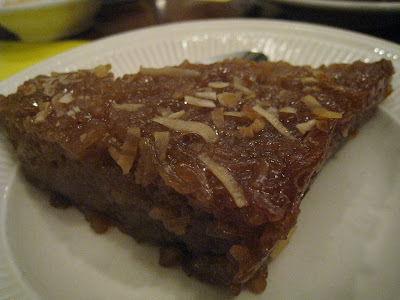 It is a large menu with vegetarian dishes, seafood, poultry, beef and pork. However if you pay close attention, they're pretty much all the same dishes just with different meat. Curry dishes make up a large portion of the menu. They also offer room-temperature noodles, which everyone at my table was afraid to try. You are also able to specify the spiciness of your dish ranging from none, mild, medium, hot and extra hot. Along with my water I ordered an 'Iced LaPetYay' which is Black tea with condensed milk and sugar for $1.99. It was good and strong. For our appetizer we ordered the 'Gram Fritter ' which are deep fried patties of yellow split peas, ginger, garlic, and cilantro blended together. An order came with 4 for $4.99. 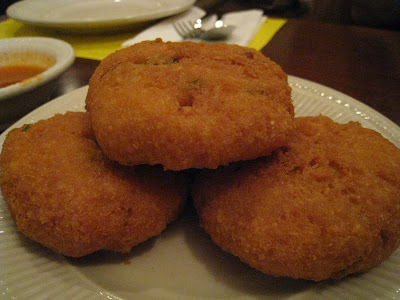 It was super yummy, crispy, freshly fried, and flavorful in the middle. 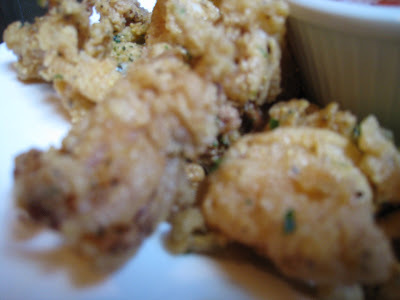 The Gram Fritters came with a sweet and spicy dipping sauce. Similar in consistancy with duck sauce at chinese restaurants. Onto entrees. Everyone at our table got some sort of curry since it seemed like a speciality. Two of my cousins ordered the same thing with different spice levels. 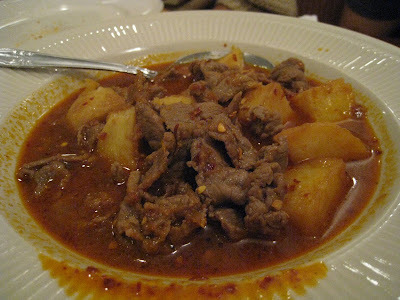 They ordered the 'AMeThar ALoo Hin', sliced beef and lightly fried potato simmered in onion-tomato base curry for $12.99 each. The one below is the spicy version. As you can see the curry is redder, and there are a ton of pepper flakes all over it. It had a warm flavor to it. Definetly spicy, with a bit of cinnamon. The potatoes were very tender as well as the beef. The curries were served with jasmine rice, which by the way was cooked perfectly and soaked up all the liquids. 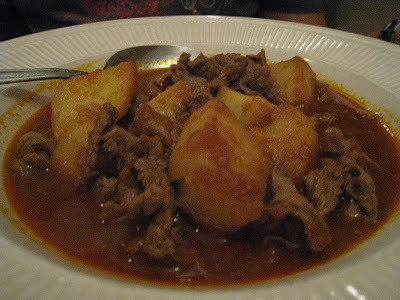 This was the mild version of the beef and potato curry. Delicious as well, but sometimes its better to have a little kick. My bf ordered the 'KyetThar ALoo Hin (dark meat)', chicken chunks and lightly fried potato simmered in onion base curry for $11.99. It's the same curry as the other 2, but it was with chicken. He ordered it extra spicy, and he was definetly hurting during it. Some places will claim their dishes are spicy when they really aren't. 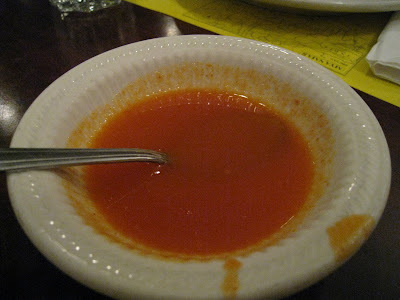 However when Mandalay says it's spicy/extra spicy, your nose will run, and you will sweat! I ordered a seafood curry called, 'Ngar MaGeeThee Hin', lightly fried catfish simmered in onion-tomato base curry with tamarind and green pepper for $11.99. You can get this dish with salmon if you'd prefer. I got it in mild because I was nervous about the spiciness, however it wasn't spicy at all. 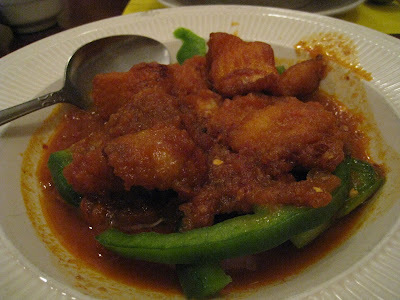 The fish was cooked well and breaded, the green peppers were still crisp and the curry was flavorful. It was a bit sour from the tamarind, which was different from the other curries. Burmese curries seemed to differ from Indian curries and Thai curries in that they are more runny/liquidy, and are more tomato-based. But similar to Indian curries, there are a ton of different spices it in to give huge, bold flavor. For dessert we decided to try the 'Sticky Rice with brown Sugar & Coconut' for $2.99. It was served hot, and was very sweet. It was very tasty, but very think and heavy to eat. It was hard to eat it because we were stuffed from the other foods, but we ordered 2 anyway. I would recommend this place to those who aren't afraid of bold flavors or trying something new. 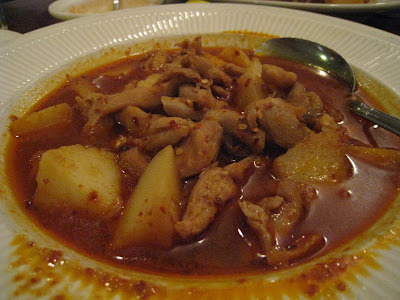 The prices are good, the portions are manageable, and the food is very tasty and spicy if you like that sort of thing. It's good for group dinners because they have tables to accomodate large parties. An enjoyable, laid-back dining expirience. 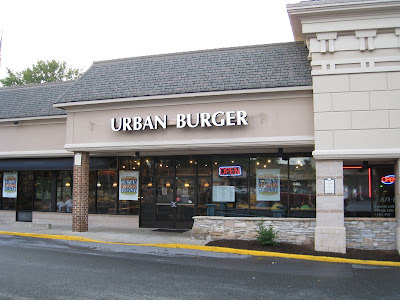 A few weeks back it was decided that Urban Burger would be the choice for dinner. 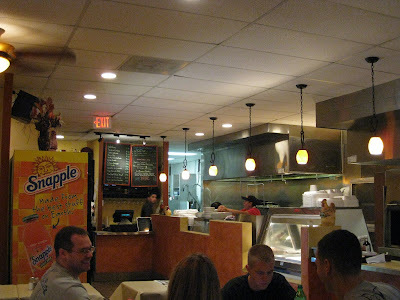 It is located in Rockville in the Rock Creek Village shopping center. The closest metro stop is Rockville on the red line. It's in a quiet neighborhood shopping center with a ton of parking. Sorry, no outdoor seating! You order at the counter, and they call your name when your order is done. The interior is spacious, and the tables aren't too close together. I don't think anyone likes to be packed in so they're eating with the table next to them. It's also very clean looking. They have a fixens bar with the normal stuff (i.e. lettuce, tomato, pickles, ketchup, mustard, mayo, etc), a shelf with a bunch of different hot sauces, and another shelf with random books to read while you grub. 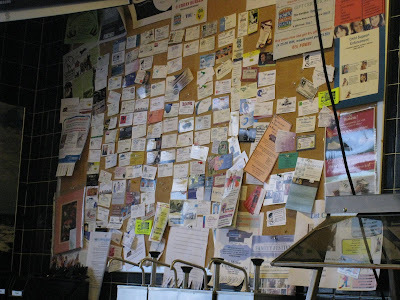 What's nice about this neighborhood burger joint is that it feels like a homey place with books to relax and read, and 2 large bulliten boards filled with business cards and fliers for whatever services there are in the area. Ok onto the food!! Obviously burgers are the highlight of the place, so they have a little process on what kind of burger you can get. Step 1: Pick a Meat (Angus, Chicken, Bratwurst, Bowl, or Veggie). All are $5.34 except the bowl for $8. 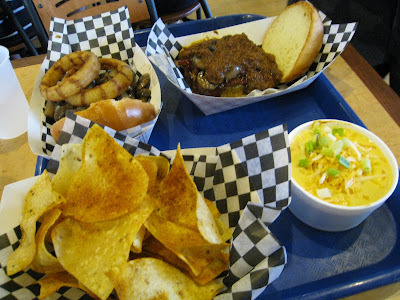 Step 2: Pick a Style (Urban BBQ, Savannah, Frank's Favorite, Blazin' Saddle, So-Cal, or Bleu Bayou). These are all $1 extra. Step 3: Pick Extra Stuff (american cheese, chedder cheese, mushrooms, BBQ beans, chili, avocado, etc). These are $0.50 extra. As our starter, we ordered the 'Redneck Fondue' for $5. It's 2-meat chili with 3-cheese sauce. It was yummmmmy. 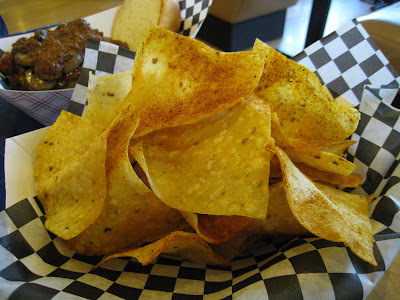 It came with fresh, spiced tortilla chips that were thin, crispy, and warm. I liked the spice on it too to give it a little kick. The bf ordered the 'Blazin' Saddle on Angus Beef with mushrooms". It was a good sized burger, and they don't skimp on the toppings at all. This was was slightly messy to eat, but the bun was nice and buttery, and the angus beef flavor is always so much better than a regular beef patty. 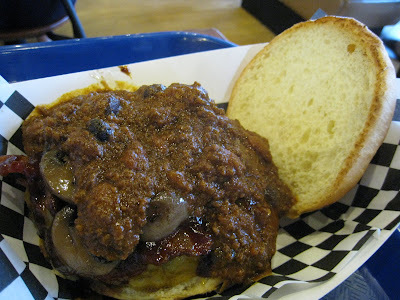 However because chili can have an overpowering flavor you couldn't taste the mushrooms or the cheese. I ordered 'Frank's Favorite with Angus Beef'. Once again the Angus meat is just good on it's own. 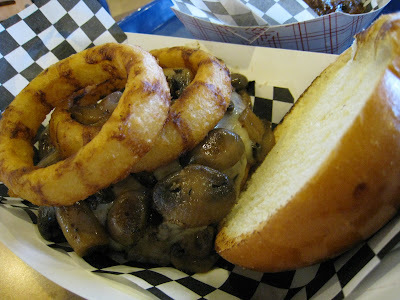 The onion rings were yummy, but the mushrooms didn't have much flavor. Overall, I thought the burgers were good, but not mind-blowing. If it wasn't for the angus meat, then the burgers would be super mediocre because of the lack of seasoning. The fondue was delicious though, and I like the place and the people that work there. Perhaps next time I won't pile so much onto my burger because sometimes that can take away from the the joy of a 'simple' burger. I would recommend this place to those that want a casual meal, but don't want to have a server, or don't want to hit up a fast food drive through. The place is relatively inexpensive with the most expensive items being $8. 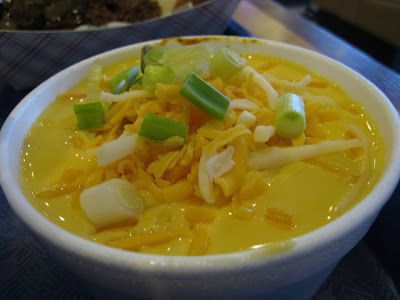 They were also on the Washingtonian's Cheap Eats list for 2008. They do offer other items like salads, for those who do not want a burger. It is also accomodating to vegaterians by offering a veggie burger option. 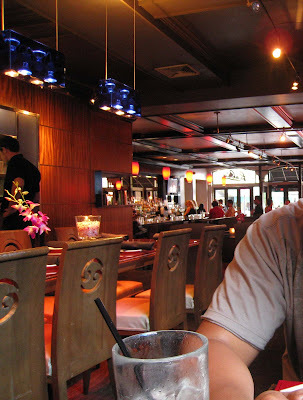 A few months back my bf took me to Paolo's, and Italian restaurant located in the heart of Georgetown. The closest metro stop would be Foggy Bottom-GWU on the Blue/Orange line. It is located on Wisconsin Ave near N St. It has outdoor seating along the side underneath an awning for when the weather is pleasent outside. Due to the restaurant's location there is only street parking available, which can be a bit of a hassle when you're trying to make your reservation time. 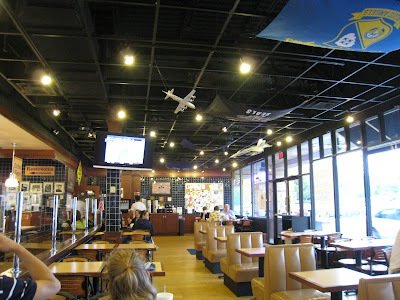 The inside is decorated with trendy yet warm decor and is a normal sized restaurant with a bar in the front. 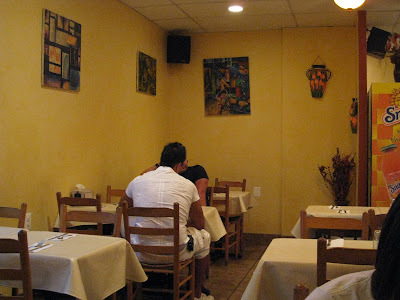 There are 2-seater tables along the wall, booths in the back, larger tables in the middle, and another room off to the right. Sorry my bf's arm is in the shot! 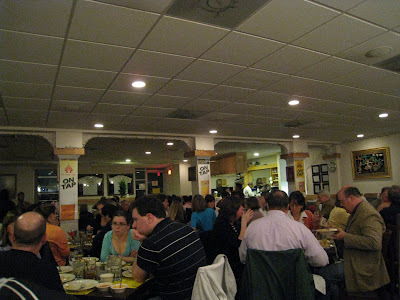 We had reservations on a Saturday around 6pm, so it was not really crowded at all, however when we were leaving there were a lot of people around the bar, and much more hustle and bustle in the dining room. 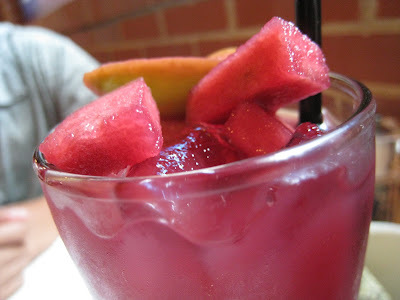 I ordered a glass of red sangria, which was delicious and arrived in a tall skinny glass with fruit on top. While waiting for our food we were given seasoned breadsticks to dip into a sort of olive-spread. 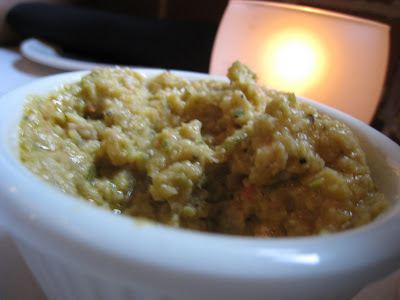 If you love olives, then you'd love it. It was a bit strong in flavor, so I did end up eating most of the bread alone. 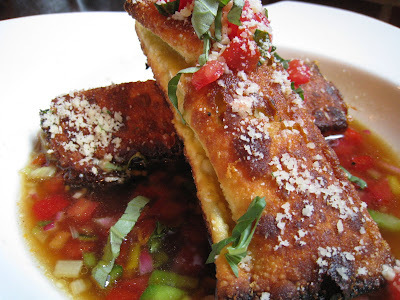 For our appetizer we ordered their 'fried calamari with spicy cherry peppers and house marinara' for $12. It was very tasty, and had a great crispy outside that was seasoned well. My only critique would be that the outside would fall off the squid everytime I stuck one with my a fork, so a lot of the time I would eat the squid 1st then pick up the fallen fried part later. Stupid camera! My bf ordered a dish that was a daily special, so I don't remember the name since it's not on the menu. Sorry! In a nutshell it was duck fried in puff pastry. I am a lover of all things duck, however this duck was much more gamey than I prefer. Now onto my entree! 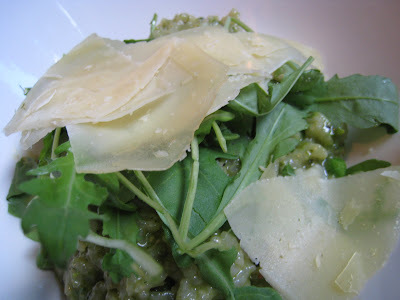 I ordered the 'risotto of spring pea and fresh herbs with arugula, prosciutto di parma and parmesan cheese' for $15. 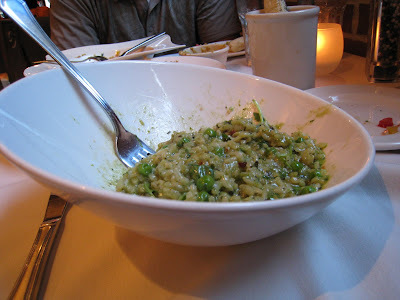 This was my 1st time having risotto after all those years of hearing that word on the Food Network. It is a rich and creamy traditional rice dish in Italy. It was actually very yummy! Be forewarned, it's very green because of peas, herbs and arugula, therefore it tastes like steamed veggies. It is not a light-flavored dish, but I would get it again. Also gotta love the cool bowl it came in! We were so full that we didn't have room for dessert but they do have 9 different options for those with a sweet tooth. The most expensive item on the menu was the '10oz. cayenne espresso filet mignon' for $32. Service was good, not wait either. I would recomment this place for an easy-going date, and since it's in Georgetown you can walk around town afterwards, and it's cute on the inside. However I did see a table with 3 little kids at it, so it can be a family restaurant since the volume in there was average. 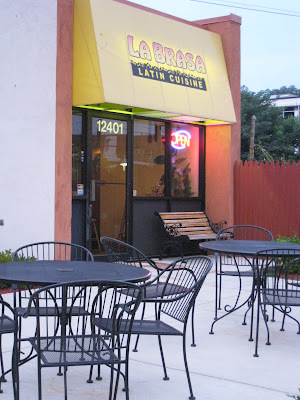 I had the pleasure of having a casual dinner at La Brasa, a Latin restaurant located in Rockville, MD, close to the Twinbrook Metro stop on the Red Line. I was pleasently surprised how cute and comfy the place was considering it's located in a more industrial part of the city across from a gas station on Parklawn Dr and hidden in the shadows of the US Health and Human Services Building. There are outside chairs and tables for those that prefer the ambiance of being outdoors. The parking is on the side of the building and there is just enough. ...but I was wrong! It's very inviting with warm colors, lights and the table cloths. You are able to seat yourself and a server will come over to your table and hand you menus. You also have an option to walk right up the register and order food to go. 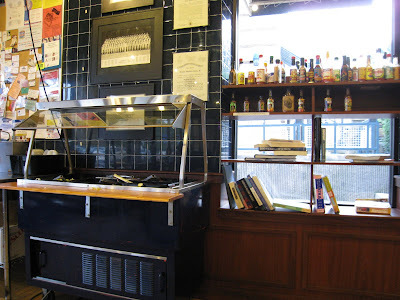 As you can see, the place is very small but there are many small tables within the resturant. On a Friday night, it wasn't very crowded, so food was served quickly. Instead of being my usual boring-water self, I decided to order a special drink they had there, and it was called Tamarindo for $1.75. 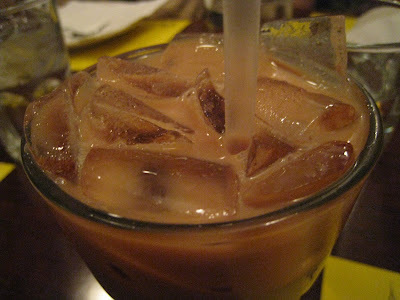 It is a juice made from the Tamarind plant that looks like a large, brown string bean pod with a couple brown sticky things in them. 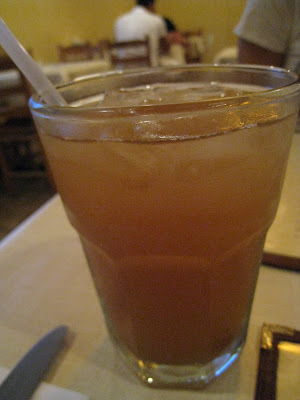 In a nutshell, the drink tastes kinda like apple juice but with a more fragrant and tart taste. There is no pulp, just the juice, and it's quite refreshing! 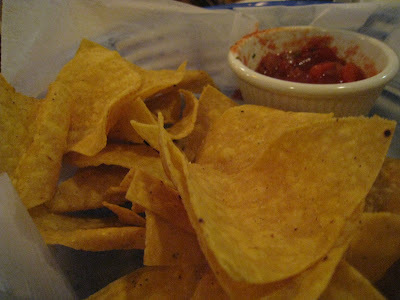 A little perk about dining in is the complimentary tortilla chips and salsa. Plus the staff is extremely patient, helpful, nice, attentive and warm. Good service can make or break a restaurant, and this place has awesome service. This place has food ranging from chicken (which I got and will discuss), to burritos, fish, soups, salads, steaks, carne asada, etc. 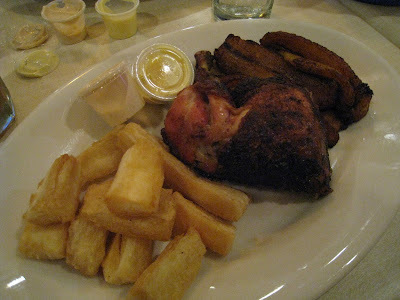 They also have a large selection of sides including fried yuca, fried plantains, and black beans. 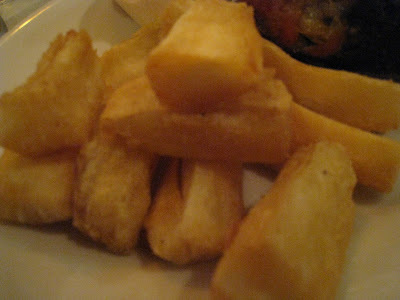 The yuca was very good, starchy, crisp, and fried just enough. I liked eating it with ketchup because they're very much like big french fries but slightly sweeter. The chicken had the right amount of seasoning. 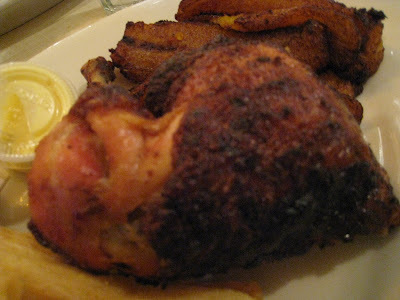 Some other peruvian chicken places are a bit salty which I think can take away from the other spices. The chicken was drier than others that I have had, but was by no means dry. It was very tender, and was easy to remove from the bone. 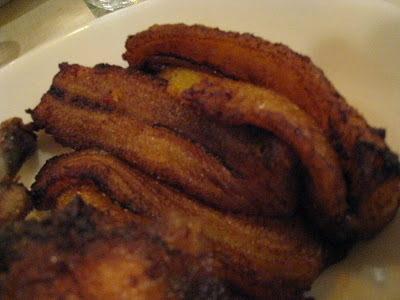 I'm a huge fried plaintains fan, and these passed my test! They were sliced long-ways instead of into smaller slices, which I think helped make them more tender. They were very soft, caramelized and tasted sweet. I wish I had ordered some to go! Here is the view of the entire plate to show that it's a good amount of food for the price. My cousin came along with me and he ordered 1/2 a chicken instead and black beans and rice as his sides. He said he liked the black beans, so I'll have to get them next time. 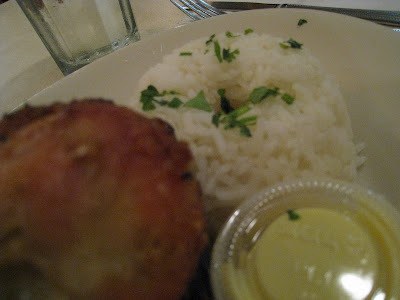 Here is the rice that he mixed his beans with, and its nice there are some herbs on top to add to the flavor. With the meals were two dipping sauces. 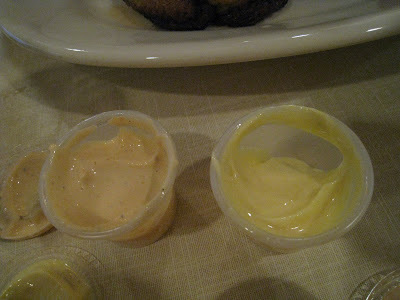 I don't know exactly what they are, but other places I've had Peruvian chick at have also served me the yellow sauce. It seems like a sort of mayo to me. The one on the left tasted spicier version of the 'mayo' to me. For the record my spicy tolerance is pretty low. Like eating too many Hot Fries at once can make me be like "ow" for a second, so please try to use that as your gauge to the hot factor of the sauce. Even though I'm full, I always have room dessert. 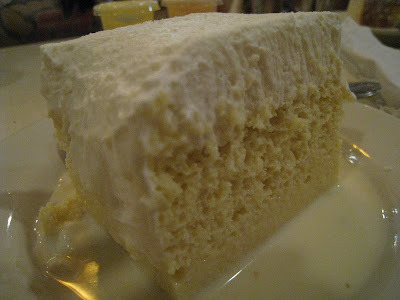 So I ordered a slice of Tres Leches cake. In Spanish it means 'three milks' cake, and it's extremely moist, wet even because of all of the liquids. My cousin asked if I wanted to share it, and I said no because I wanted my own! Dinner was relaxing because it wasn't loud and crazy in there. The service was wonderful. The food was delicious, fast and plentiful. 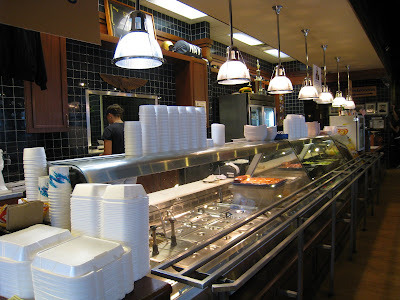 The place is very affordable with $3.75 Tres Leches cakes, and $15.75 Surf & Turf, which is the most $ thing on the menu. I would recommend this place to anyone who is up for a casual evening out, and doesn't feel up for paying an arm and a leg for good food.